Here’s another great idea of what to do in the garden in February! 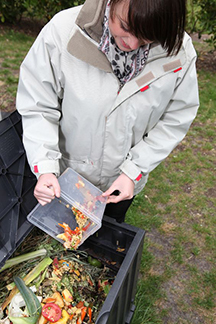 Give those compost heaps a turn! Many folks keep three compost bins side by side, ensuring a constant supply of maturing compost for the yard and garden. Here’s how this simple system works. • Set up 3 bins side by side in a partially shaded location. • Fill up Bin A with compostables first. Most folks make layers, each layer separated from the next by a sprinkle of blood meal or compost starter (both available at Payne’s) to hasten the heating-up process necessary to transform raw materials into fluffy, nutritious garden compost. • When Bin A is filled, transfer its contents to empty Bin B; the transfer process aerates the maturing compost, hastening its ripening. • Add more compostables gradually to Bin A until it is filled a second time. • When Bin A’s filled up again, transfer Bin B’s compost down the line to empty Bin C to complete its maturing, leaving Bin B empty. • Transfer Bin A’s second compost batch to the newly emptied Bin B as before. By the time Bin A is filled a third time, Bin C’s compost will be ready for the garden!